A University of Houston researcher and his team have discovered an important link between alcohol and breast cancer by identifying a cancer-causing gene triggered by alcohol. Lin, an assistant professor with the UH Center for Nuclear Receptors and Cell Signaling and the Department of Biology and Biochemistry, and his former Ph.D. student, Nicholes Candelaria, describe their findings in a paper titled “Alcohol Regulates Genes that Are Associated with Response to Endocrine Therapy and Attenuates the Actions of Tamoxifen in Breast Cancer Cells,” recently appearing in PLOS ONE, an open access peer-reviewed scientific journal published by the Public Library of Science. Lin and Candelaria, who graduated from UH in 2015 and is currently a post-doctoral fellow at Baylor College of Medicine, collaborated with renowned alcohol researcher Rajesh Miranda, a professor at Texas A&M University. It is estimated that tens of thousands of breast cancer cases in the U.S. and Europe each year are attributable to alcohol consumption and that drinking is also associated with an increased risk of disease recurrence in women with early stage breast cancer. The study objective was to determine how alcohol can affect the actions of estrogen in breast cancer cells. The research team not only established that alcohol increases estrogen-induced cell proliferation, but their findings also provide a direct link between alcohol, estrogen and a cancer-causing gene in promoting cancer cell growth. They found that alcohol inappropriately promotes sustained expression of BRAF, even in the absence of estrogen, thereby mimicking or enhancing the effects of estrogen in increasing the risk of breast cancer. Another key finding was that alcohol weakened Tamoxifen’s ability to suppress the rapid growth of cancer cells. Lin and his colleagues posit that their results suggest exposure to alcohol may affect a number of cancer-related pathways and mechanisms. They say these findings not only shed light on mechanistic actions of alcohol in breast cancer, but also provide fresh insight to the cross-talk between alcohol and cancer-related gene pathways and networks in breast cancer. Their ultimate goal is to use this knowledge in breast cancer prevention, but Lin says their findings also have implications for women who are undergoing hormone replacement therapy for menopausal symptoms, as alcohol can affect the actions of the hormones they take to manage their symptoms. The research highlights potential long-term health effects for college-age women, as well, who might find themselves in situations where heavy or binge drinking is part of the social environment. 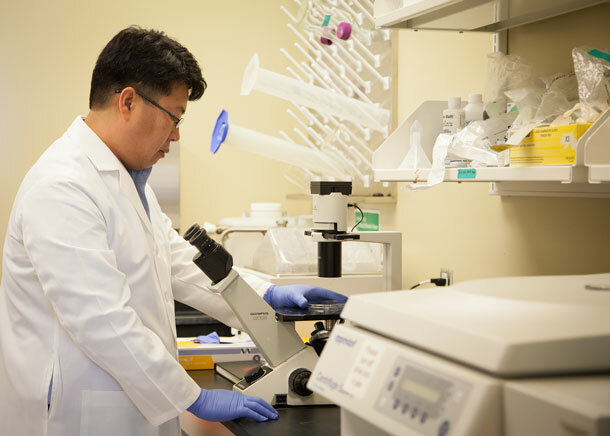 The research was funded by a portion of the new faculty start-up funds Lin received upon his arrival at UH, and he is currently working to secure additional funding from federal and state funding agencies. The University of Houston is a Carnegie-designated Tier One public research university recognized by The Princeton Review as one of the nation’s best colleges for undergraduate education. UH serves the globally competitive Houston and Gulf Coast Region by providing world-class faculty, experiential learning and strategic industry partnerships. Located in the nation’s fourth-largest city, UH serves more than 42,700 students in the most ethnically and culturally diverse region in the country. For more information about UH, visit the university’s newsroom. The UH College of Natural Sciences and Mathematics, with 193 ranked faculty and nearly 6,000 students, offers bachelor’s, master’s and doctoral degrees in the natural sciences, computational sciences and mathematics. Faculty members in the departments of biology and biochemistry, chemistry, computer science, earth and atmospheric sciences, mathematics and physics conduct internationally recognized research in collaboration with industry, Texas Medical Center institutions, NASA and others worldwide. Established in 2009, UH’s Center for Nuclear Receptors and Cell Signaling (CNRCS) is a leading component of the UH Health initiative. Led by Jan-Åke Gustafsson, a National Academy of Sciences member and world-renowned expert in the field of nuclear receptors, CNRCS researchers are involved in many aspects of nuclear receptor research, all focused on understanding the roles of these receptors in health and disease. CNRCS researchers are working toward the goal of finding new treatments for an array of significant diseases including cancer, diabetes, metabolic syndrome and neurological disorders. Working from the center’s world-class labs, the researchers combine interdisciplinary research and dynamic collaboration with the Texas Medical Center and industry partners. To receive UH science news via email, sign up for UH-SciNews. For additional news alerts about UH, follow us on Facebook and Twitter.